Our product range includes a wide range of liquid weigh filler machine. 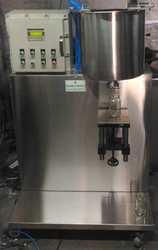 We manufacture net Liquid Weigh Filler Machine to first weigh the product to be filled before it’s dispensed to the container in order to ensure total accuracy of fill level in each container. This not only means you’ll have aesthetically pleasing fill-line results, but also that you will have consistency from one container to the next. Achieving such accuracy also means you won’t be under or overfilling containers, which can save money in product and boost customer satisfaction levels. Precise weight measurement for accurate and consistent fill. Gentle fill system prevents loss of volume through overspray. Net weight fillers are compatible with a wide range of products and can be used for a quarter of an ounce up to five gallons worth of product. Looking for Liquid Weigh Filler Machine ?